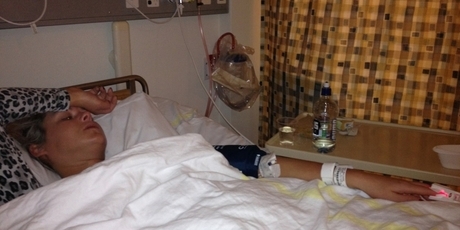 A mid-winter escape to Fiji turned into a near-death experience for an Auckland woman. Mary Kent needed time out last month and headed off to celebrate a friend’s birthday. Photos of the 26-year-old marketing and sales manager show her laughing, relaxing in five-star resorts and dining at luxury restaurants during her five-day holiday, unaware a deadly parasite was taking hold inside her body. She visited her GP on July 4 – nine days after her holiday ended – and he, too, diagnosed flu. She returned to the medical centre on Sunday, and was prescribed pain killers and sleeping pills by a different doctor. Ms Kent’s family live overseas, but her boss and his wife were becoming increasingly worried. She returned to her doctor, who referred her to Auckland City Hospital and she went to the emergency department the next morning. But her symptoms kept escalating the next day – to the point she couldn’t stand sheets touching her skin, or her toes rubbing together. Her skin started to bruise. By the time she got to ED, she was losing consciousness. Head of neurology Dr James Cleland ordered a lumbar puncture – where spinal fluid is tested – and the test results were frightening. She was diagnosed with eosinophilic meningitis. Ms Kent said she had only one meal on the trip that she didn’t share with friends – a pawpaw, lettuce and coriander salad. Although she was lucky the disease was caught, she was upset that the first doctor she saw at the hospital did not recognise her symptoms and act on them earlier. Ms Kent’s mother, Leanna, has returned from Kazakhstan to look after her daughter. Ms Kent wants to warn other travellers to be wary when heading to the South Pacific. • Eosinophilic meningitis is mostly caused by ingesting the larvae of a parasite – angiostrongylus cantonensis – in raw or undercooked cooked snails, slugs, freshwater prawns, frogs, or fish. • Infection can also occur by eating fresh produce such as lettuce that a slug carrying the parasite has crawled on. • Once ingested, the larvae make their way into blood vessels and eventually reach the spinal cord and die. An eosinophilic reaction develops in response to the dying larvae, and spreads rapidly through spinal fluid. • It is prevalent mainly in Southeast Asia and the Pacific Basin. One Response to "Fiji salad bug almost killed NZ tourist"
Hi please try homeopahty medicine for eosinophilic meningitis.. there is a medicine called apis and many other medicine available.